For other running routes, see the Route List. 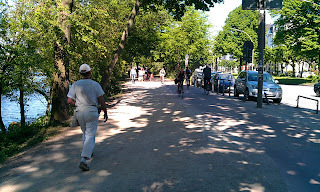 I've lived in Hamburg for many years, and this, in my opinion, is the classic running trail in the old Hansa-town. Have fun! Hamburg is a very green city, with most neighborhood streets tree-lined, and with an abundance of rivers, canals and lakes. 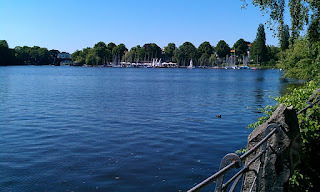 The Alster River was dammed-up hundreds of years ago, and has since been the recreational heart of the town. 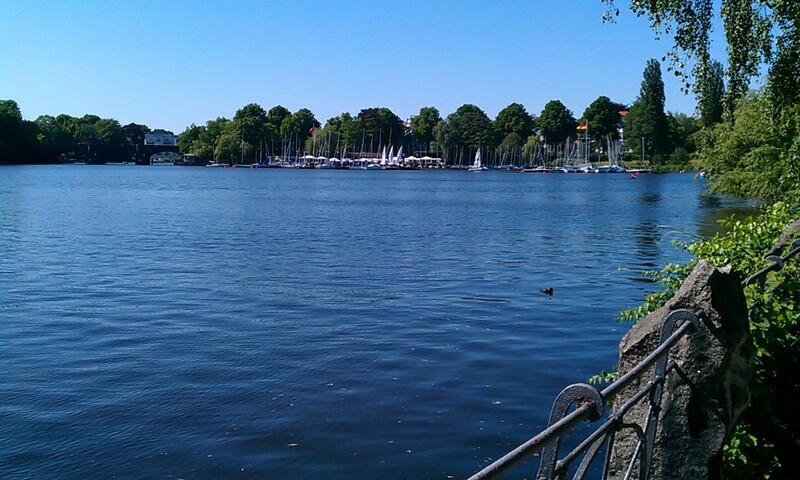 There is a small Binnenalster lake directly in the town center, providing a watery view right from downtown. The Binnenalster lake is separated by the bigger Aussenalster by a causeway and bridge. 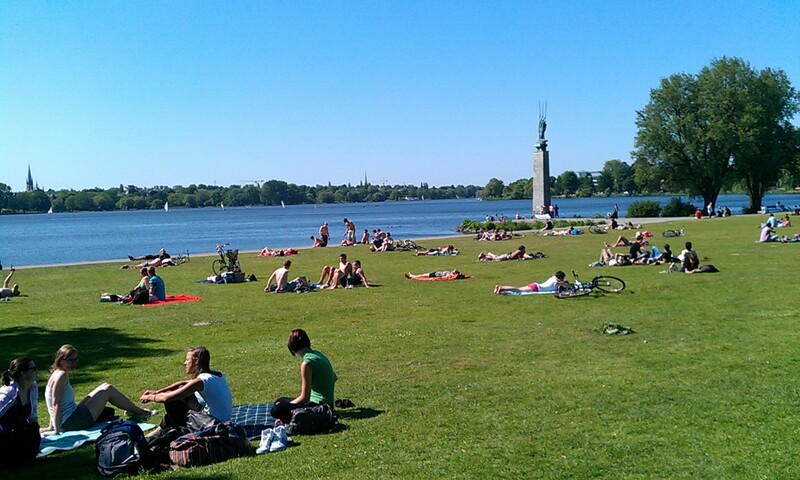 The Aussenalster, though, is the place to run, lined with parkland, making it the perfect place to run in Hamburg. In fact, it's the main jogging track, comparable to the Central Park reservoir in New York, with lots of runners at peak times. 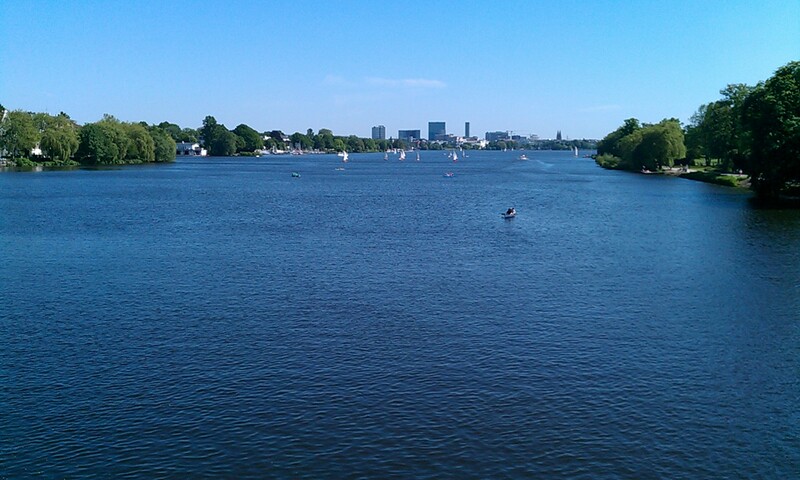 But the Aussenalster is even better than Central Park: the scenery is nicer and you don't have to do 10 laps to get in a decent run, given its 7.5-km circumference. To choose a random starting point on the loop, let's go to the restaurant and boat landing at Fährdamm, on the west side of the lake. 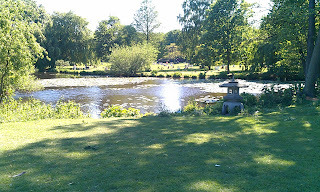 This is in the nicest, widest part of the Alster park, not far from the Hallerstraße U-Bahn station (U1 line). 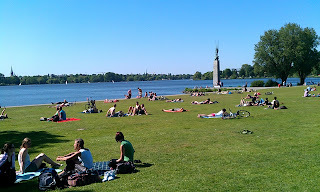 Most races around the Alster start here. And now we'll choose a random direction, because it doesn't matter which way we go. Let's head south, rounding the lake counter-clockwise, with the water on our left. Guidance isn't really needed here, there is only one way to go, but I'll describe it anyway. The path along the water provides a great view of the lake, with its sailboats (in the summer) and tour boats. At Rabenstraße, the park ends, and it turns into a narrow green-stripe with walk- and bike-ways. You'll see an area screened off with security barriers on the right, the American consulate, sometimes called the "Little White House" due to its classical white facade. The British consulate was a few blocks back along the lake, but was closed down for cost-savings. Nevertheless, Hamburg has more consulates than about anywhere in the world, still. 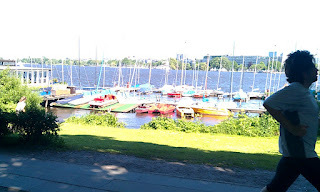 After the Little White House, you'll pass a couple of rowing clubs and boat docks on the water side, and the path curves to the left where the Kennedy bridge separates the Aussenalster from the Binnenalster. If you want to add a couple of kilometers, you can continue UNDER the Kennedy bridge to the other side, and lap the Binnenalster. 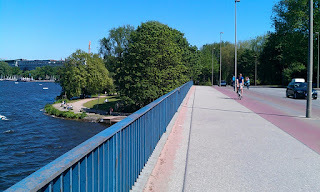 But for this route, we'll stay on the Aussenalster, following the sidewalk sloping up to the bridge, and cross the bridge to the other side of the Alster, running eastwards. The east side of the lake also has a thin parkland, but there is a loud street next to it, so it's not as nice. And there are places where the bike lane is squeezed into the sidewalk, making it more than a bit hectic. Hey, share the road! It starts getting tighter here, and loud! You'll pass a few boat rental places and waterside cafes, as well as the Hamburg Segel Club, where I sometimes go sailing. Just keep going, keeping close to the water. Eventually, the dirt path veers to the left along Schöne Aussicht, where the main street continues going straight. Follow Schöne Aussicht. You'll pass a couple of boat clubs on the left, and a pretty mosque to the right. Then the road curves around to the right, away from the water, to get around a small bay. The street will run into the busy Weichmann Straße, but just turn left, go over the bridge over the bay, and then turn off to the left again on Bellevue to get away from the loud street. This is Hamburg's barbeque mile on nice summer evenings. The path runs next to the water again, and soon you're at the north end of the lake, at Bobby Reich's restaurant and marina. Just run the short stretch along the north end (just another 100 meters), cross the Krugkoppelbrücke bridge, and turn to the left again as soon as you can, to stay along the water, entering the west-side park again. Now it's just half a kilometer straight south to your starting place.